A tradition of the Center since 1972, Log Lunches are held on Fridays during the academic year at noon at the Log on Spring Street. 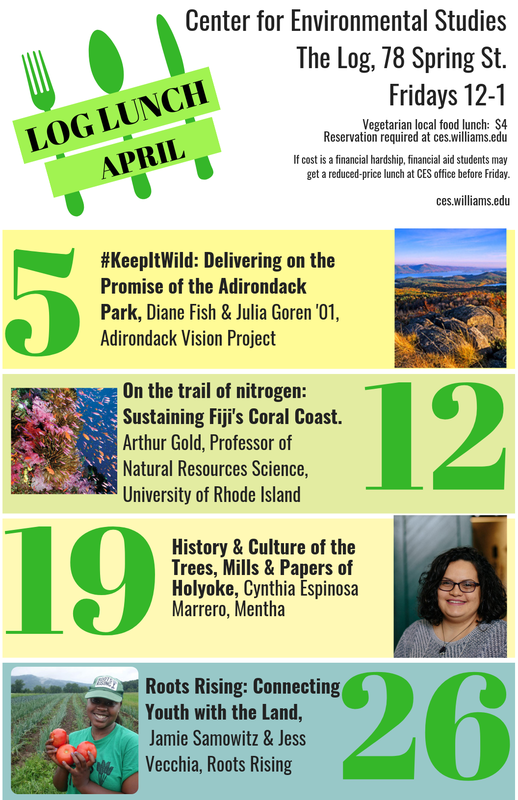 Each week, a vegetarian lunch prepared by Williams students is served, followed by a talk on an environmental topic. Speakers are drawn from both the student body and faculty of Williams, as well as from local, national, and international organizations. Log Lunches are open to the entire Williams and Williamstown communites. The cost of each lunch (soup, salad, and homemade bread) is $4. Subscriptions may be purchased by the semester: fall $36 ($32 for first years); spring $32 ($28 for seniors). Reservations are required. Call the CES office at (413)-597-2346.